Rhubarb season is one of my favourites. There are a few fruit seasons that I always look forward to – cherries, blueberries, pineapple – and rhubarb is definitely right up there. It is my ultimate winter fruit (or vegetable, to be precise); perfect in baked goods and pie, delicious poached or, as I’ve recently discovered, most delectable when oven roasted. 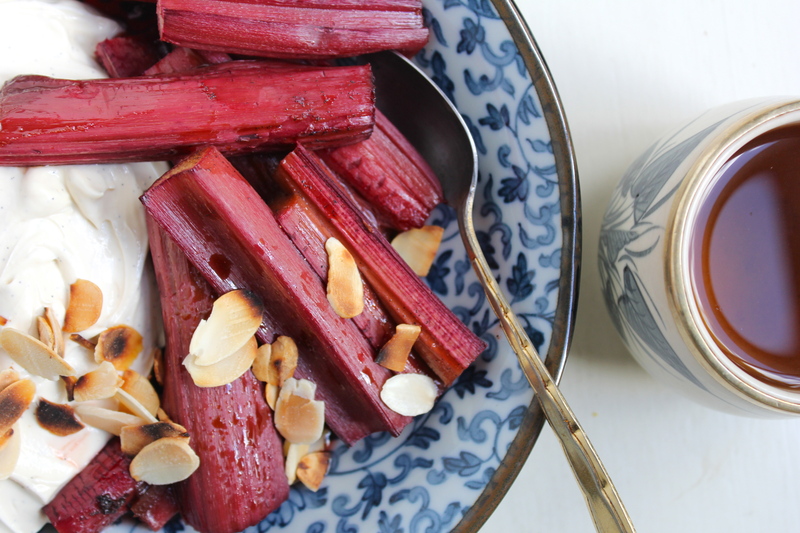 Although please be warned, this will not be the last rhubarb recipe this winter! It’s been a surreal week. Truth be told, it feels kind of trivial to be writing about food given the war and heartache that seems to be everywhere at the moment. I find myself formulating arguments and thinking about conflict when I wake to go to the toilet during the night, and all day my twitter and facebook feeds are full of links to news and articles one more devastating than the next. Tempers are frayed and while we all bicker about who is right and who is wrong people continue to suffer. It is all too fucked up. Perversely, though, life goes on. 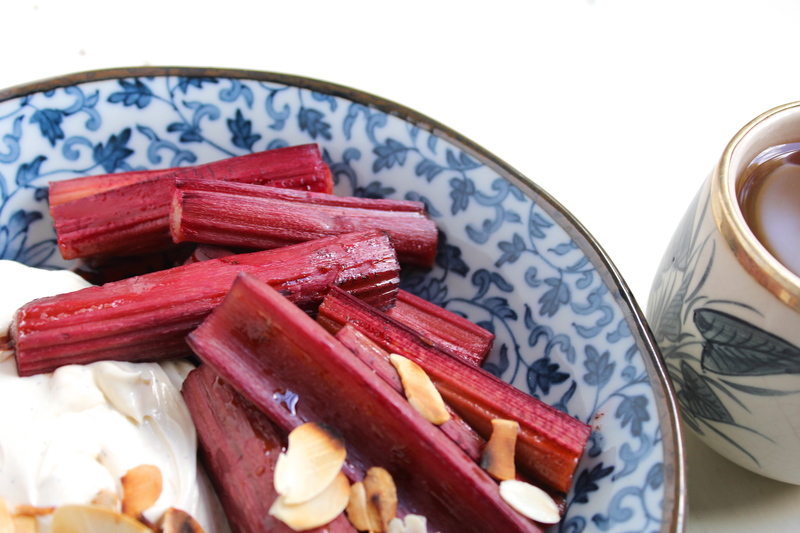 And so here you have it, Oven-Roasted Rhubarb with Vanilla Spiced Labneh. This recipe is really simple but oh-so-fantastic. 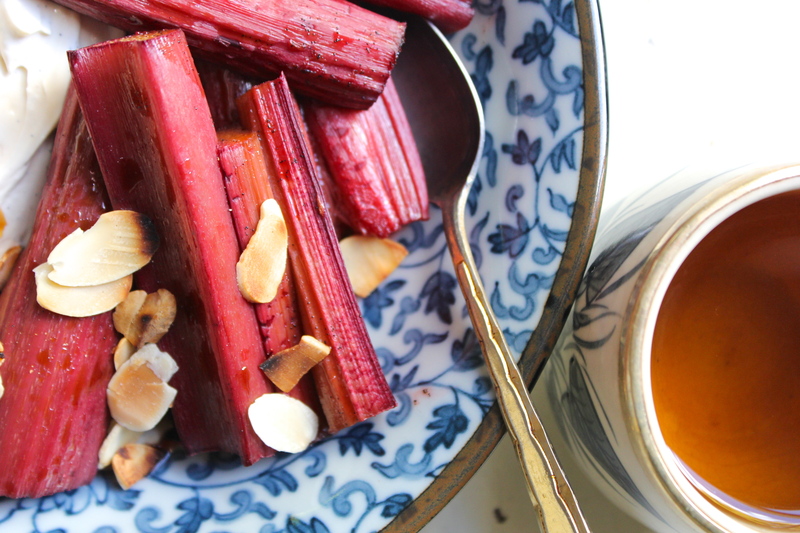 Roasting rhubarb brings out the depth of flavour and the orange blossom water adds a lovely perfumed hint. The coconut sugar is just enough, sweetening the rhubarb but still leaving it nice and tart, the way it was born to be. You could easily serve this with vanilla icecream or even whipped cream for dessert, but I find it pairs beautifully with the vanilla-spiced labneh – not too sweet and wonderful for a slightly decadent morning tea. 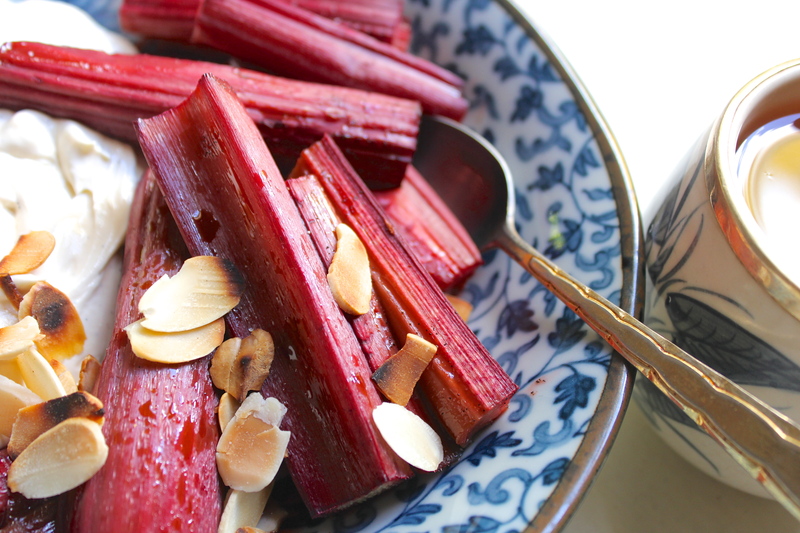 This dish makes a generous quantity of rhubarb; I eat the leftovers on porridge and with muesli for the rest of the week and my mornings are all the brighter because of it. Remove the green tops from the rhubarb stalks and cut into pieces about 6cm long each (approx. the size of your middle finger). 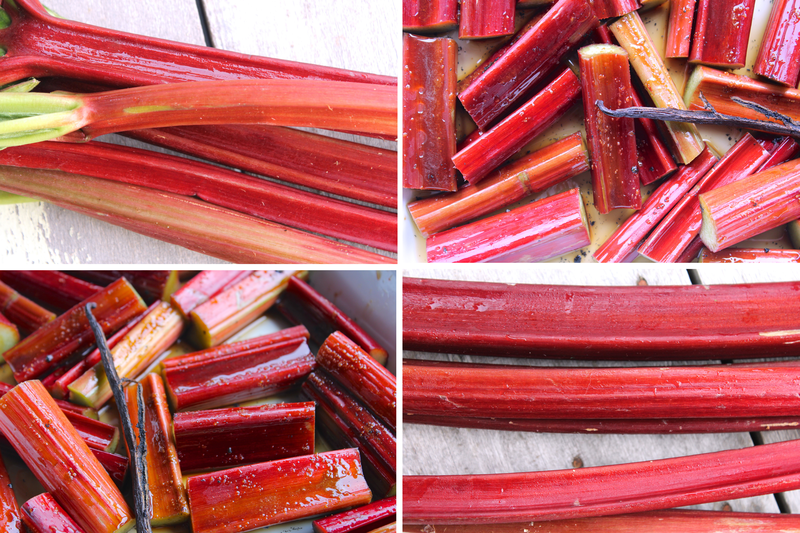 Toss the rhubarb through with the sugar, scraped vanilla bean, and orange blossom water. Lay in a single layer on a baking tray and bake for approx. 30 minutes, until the rhubarb is tender but still holds its shape. Prepare the labneh by stirring it through with the the vanilla paste and honey until combined. If your honey is too thick, thin out with a little bit of water before combining with the labneh. Toast the flaked almonds in a dry pan over a medium heat until the start to brown, approx. 2 -3 minutes. 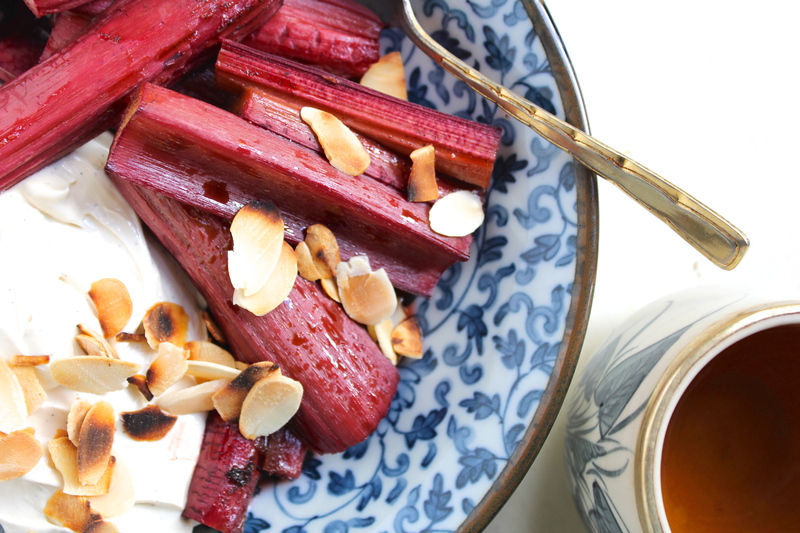 Divide the labneh amongst two bowls and top with a spoon or two of the roasted rhubarb and a scattering of almonds. Eat immediately. Notes: the rhubarb will keep in the fridge for up to five days, and the labneh for up to three days. Yes, it is incredible sad how life perversely goes on in spite of the suffering around us. This would be an uplifting and bright breakfast to me too. I have yet to make labneh but I really want to. This really looks lovely, but must wait for rhubarb to come back in season. You definitely should make it! I was intimidated before I’d ever tried but it is so easy and is now a staple in our house.